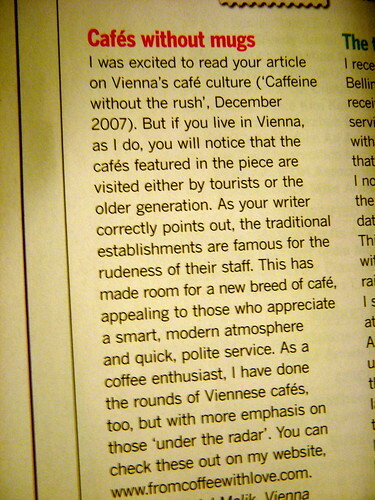 In any case as you can see above, they were so impressed with my letter that they published it in their February 2008 Edition. I managed to get some publicity too and surprise! surpirse!, I got my most hits on this website and blog during the month of January 2008. So I just wanted to say thanks to the Editor and staff at CN Traveller. If you’ve got the cash and want to dream about your next holiday to amazing places, I recommend you buy this fabulous magazine and I ain’t getting paid to say that, honestly ! This entry was posted on Wednesday, February 20th, 2008 at 1:27 pm	and posted in Thoughts. You can follow any responses to this entry through the RSS 2.0 feed.